With the holidays fast approaching, it is crunch time when it comes to deciding what to send to your clients. Sure, you can mail a traditional card, but will it stand out among the 50 other cards they will receive from family, friends or other businesses? The more unique your idea is, the more likely it is to be remembered — and, even better, talked about at holiday parties. 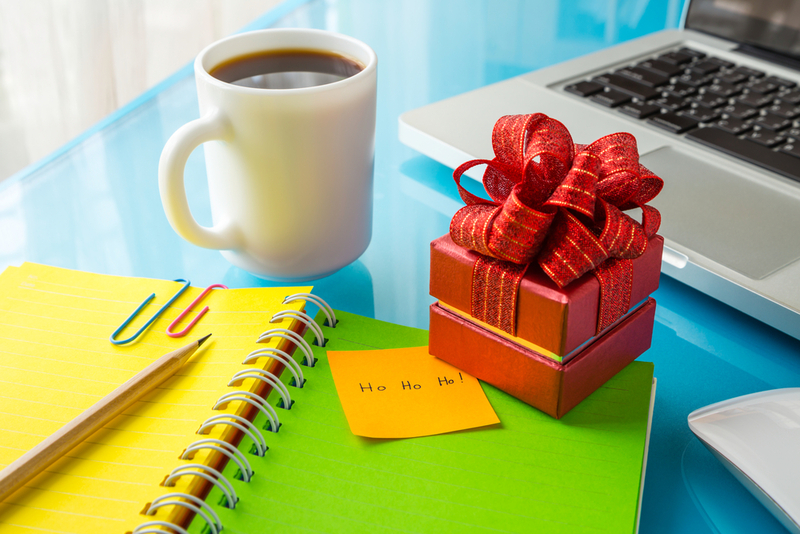 Here are six unique holiday marketing ideas that are sure to be noticed by your clients. I love the idea of sending “happy mail!” Happy mail involves sending an object, like a ball or a pair of flip-flops, via the USPS without putting it in an envelope or a box. You simply put the stamps and the label right on the object you are mailing, and as long as the item is lighter than 13 ounces, it will qualify for USPS first-class shipping rates. Once I learned about this idea from the blog Giver’s Log, my head started to spin with the possibilities of items lighter than 13 ounces that can be mailed. Many of these small gifts can be purchased at your local dollar store, which makes it even better from a budgetary standpoint! Send a small puzzle with a colorful label. Buy a small canister and put tape and labels in it for holiday wrapping. Make a “relaxation package” by filling a canister with a small foot scrubber and your favorite lotion. Send small gifts for kids or pets. I was skeptical at first that the USPS would allow this, but I checked their regulations, and they do. So “happy mail” to your heart’s content and bring an instant smile to your clients’ faces. Do you sell a lot of homes in a certain city or area? Hire someone on Etsy or Elance to create a custom state map with a heart or symbol placed on that city. Ask for the original digital file when you purchase it, and then you can print out multiple copies to send to all of your clients. This is a unique photo your clients can frame and add to their home décor. Every time they look at it, they will think of you. Anyone can go to Starbucks and buy a hundred gift cards to send out to clients. Instead, consider to whom you are sending the gift cards and get creative! If you have a lot of young families in your database, you could send gift cards to the local bounce house. Or if you have a lot of relocation clients, you could send them gift cards to the best restaurant in town. By thinking about the “who” behind the gift card, you are able to make it more personal, which makes the impact even greater. What’s your favorite book — one that isn’t about real estate? That would be a great gift to send to your clients with a note on the inside about why you enjoyed the book and thought they might, too. This is a personal and thoughtful gift that will speak to your clients’ hearts. In this digital age, we all have at least one subscription we pay for every month or year. If you have a favorite one that is a must-have for you, consider buying a subscription for your clients as a gift this year. Ideas include a family management app, a cloud backup service for their photos or a free month of an entertainment service. By going the nontraditional route and giving your clients something they can use in their everyday life, your gift is sure to stand out among the traditional cards and gifts they will receive this year. There are so many different things you can put into a Mason jar and give as a gift. The great thing is that this is something that is personal and homemade, which your clients will love! Search the Internet and you will find jar recipes for hot chocolate, bath scrubs, soups, or fun ideas for “gifts in a jar” or “relaxation in a jar.” This is a fun way to put a bit of your personality into your holiday marketing! If you still are planning to send the traditional holiday card to your clients, I highly recommend that you make it more personal than just a typical card. Send the same card that you are sending to your family and friends, so it is more personal. To personalize it even more, send a handwritten note with the card. I know this will take more time, but it will also be more appreciated than a typical business holiday card that has little to no impact. Holiday marketing, like all real estate marketing, should be fun, personal and connect with your clients. By taking the time to really think about what you are sending and think outside of the box, your holiday marketing is sure to be a big hit! Jennifer Snyder is a Real Estate Marketing Consultant, Speaker and Blogger at Marketing Ideas for Agents. Jennifer loves to research and write about marketing ideas, tools and resources that will make real estate agents’ lives easier and help them grow their business.